OXFORD, Miss. – Many people have diverse interests, but to be highly skilled in several areas is a rarer quality. 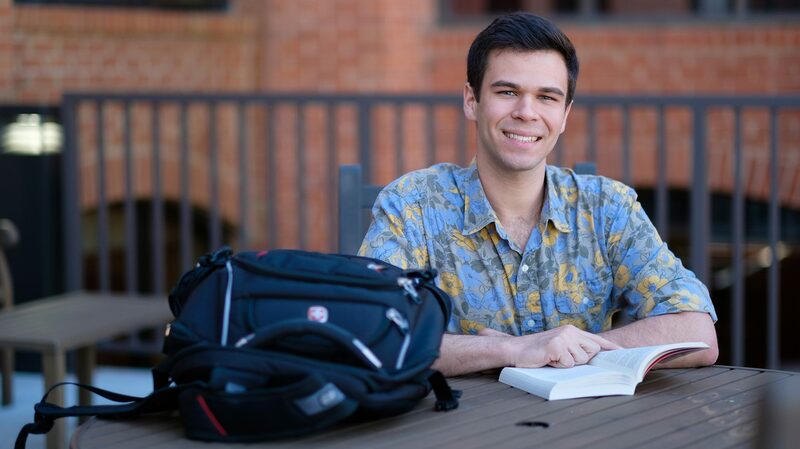 Jake Thrasher, of Birmingham, Alabama, graduated from the University of Mississippi in May with a bachelor’s degree in chemistry, but he recently earned national honors in an entirely different field: editorial cartooning. He won first place in the Society of Professional Journalists’ Mark of Excellence competition. Thrasher has always been interested in art. He attended high school at Shades Valley Visual Arts Academy, which gave students preparation for creative problem-solving in visual art for those interested in pursuing a creative career. He began working for The Daily Mississippian as a freshman at Ole Miss. “I’d always created what would be considered fine art and I was always interested in making something meaningful,” he said. While at a social event, an editor approached him to ask that he begin drawing editorial cartoons. “I had never created cartoons before and I wasn’t big into politics, but I immediately fell in love with it,” he said. It quickly became more than just art for Thrasher and developed meaning. Thrasher drew his inspiration from political and social issues. He created two or three originals cartoons each week for The Daily Mississippian during his undergraduate career. “I tried to stay constantly up to date politically, socially and on current campus issues,” he said. Each cartoon took Thrasher a minimum of four to five hours to complete for a more simplistic drawing, or up to eight or 10 hours for a detailed drawing that involved the use of watercolor and other elements. Thompson said he also went above and beyond his role by hiring and helping develop the skills of younger cartoonists and staying involved with student media. “He wasn’t required to attend daily news meetings, but he often did so to learn what stories the staff was pursuing so he could make his work more timely and relevant,” she said. Thrasher submitted three drawings to the competition, and the one featured on the SPJ website is titled “GOP Operation,” which is a satire of the children’s board game that also combines several issues. Thrasher has a passion for helping others, and he served as president of Rebels Against Sexual Assault during his undergraduate career. He plans to attend Yale University this fall to pursue a doctorate in biology and biological sciences while conducting cancer and HIV research. This spring, he was among 10 students inducted into the university’s 2017-18 Hall of Fame, one of the highest honors afforded Ole Miss students. He was also a member of the Sally McDonnell Barksdale Honors College.